My involvement with the high school cycling movement began nearly a decade ago when NICA’s founder, Matt Fritzinger, asked me to take over as head coach for the Berkeley High School Team. Since that time, I have been intricately and passionately involved in the organization's formation and growth. I understand what it takes to manage a successful high school team as I coached voluntarily for five years while working as an environmental mediator. I also served as both the President of the NorCal League Board of Directors and was on the founding committee of NICA. From there, I became the Education Director for NICA and have traveled the country as an advocate for this movement. Many of you have already met me, as I have instructed at over a dozen Leaders’ Summits in six states, teaching other dedicated volunteers across the country the nuances of youth coaching. I have also overseen the publication of the Coaches Manual and have contributed to most of NICA’s educational materials. Now, I am following Matt’s footsteps once again and taking over as NICA’s Executive Director. I am incredibly excited for this opportunity, as I have seen first hand the transformational power of participating on a well-managed high school cycling team. With over 200 high schools and nearly 800 coaches participating, NICA has successfully created a repeatable model that is enriching the lives of those involved. I am more motivated than ever to work with the extremely talented staff, both in the NICA office and in the various leagues, to help strengthen our existing programs, while also expanding into new areas around the country. NICA has crossed a threshold and is poised to become stronger than ever. I encourage you to help us grow the sport and continue with our vision of enabling every American teen to strengthen their body, mind, and character through participation in the sport of mountain biking! Known as “Coach Bobo” by many, Austin first got involved with the high school cycling movement when he took over the head coaching position at Berkeley High School back when the NorCal League first started. 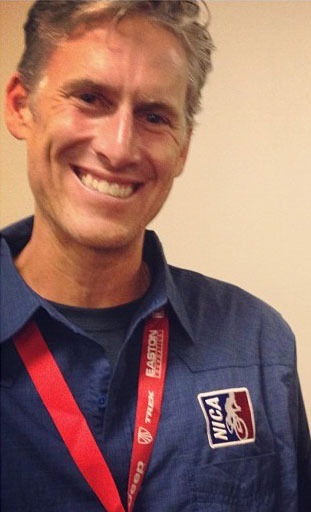 Utilizing the experiences gained from his five years as head coach of a large team, extensive race course marshaling, as well as over 30 years of riding, Austin has contributed to the creation of the teaching materials used by NICA to launch new state leagues and enhance the coach license program. With a background in environmental mediation and a masters degree in regional planning from Cornell University, Austin has also been an effective advocate for expanded off-road riding opportunities.